At first glance I thought it was a window washer, but now I'm not so sure. That's a broom on the front of the cargo bike and another instrument. Whatever the case, a little snowstorm and a mean headwind isn't stopping him. There is, however, an interesting detail that reflects the utility-minded Danish relationship to bikes. 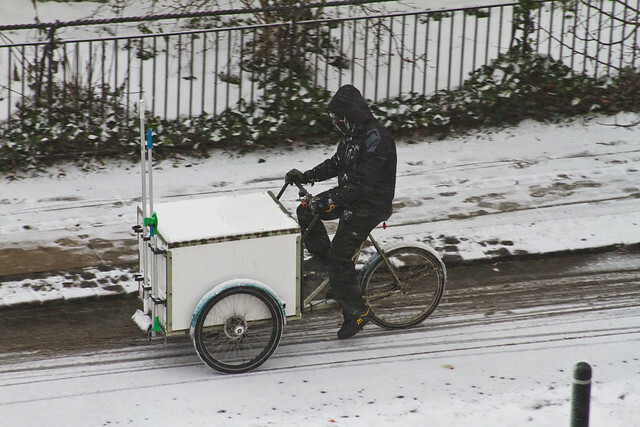 This chap has spent about 15,000 kroner (€2000/€2600) on a cargo bike - probably a bit more with that box with a lid - and yet look at the fenders. He hasn't bothered to peel off the blue, protective film. It's a good bike, an expensive bike, a useful and practical bike but hey... it's just a bike.